A Japanese tooth decay treatment that doesn't involve drills or anesthetic is becoming more popular in the US. For decades, American dentists have been treating tooth decay with the implantation of dental fillings. Now, a Japanese method of treating tooth decay is gaining popularity in the United States as a possible alternative to the “drill and fill” method of treating dental caries. This summer, at an International Association of Dental Research meeting, a new study was presented exploring the effectiveness of silver diamine fluoride (SDF) on stopping the advance of root caries in an elderly population of Japanese citizens. Participants in the study were split into two groups: one group that received treatment with a 38% SDF solution, and one control group that didn’t receive treatment with the solution. The solution was painted onto test group participants’ affected teeth annually, and the teeth were then inspected every six months over a total period of 18 months. SDF has been used as a treatment option for tooth decay in Japan for over 80 years, and the results of the study emphasized how effective a treatment this mixture can be. After 18 months, the teeth that received treatment with the SDF solution were analyzed. Researchers found that 75-87% of the study participants showed an arrest in the rate of decay on their affected teeth after annual application of SDF. The findings are particularly relevant based on new interest in SDF as a treatment method for cavities here in the US. Scientists have long known that silver has antimicrobial properties, and fluoride has been shown to prohibit tooth decay. SDF has also been shown to be an effective treatment for tooth pain. The US Food and Drug Administration (FDA) approved SDF as a treatment for dental sensitivity in 2014, but recently some dentists have begun to use the solution as an off-label treatment for caries. Dentists simply brush the solution on the affected tooth to kill bacteria and stop the spread of the cavity. Using the solution is painless and requires no injection of local anesthetic, unlike the traditional method of treatment that includes local anesthetic injection, drilling the tooth, and filling with a predetermined material. There are a few downsides to using the solution. SDF is a relatively inexpensive treatment alternative compared to drilling and filling, but it’s not yet covered by all insurance plans. SDF also causes tooth discoloration. 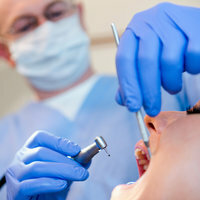 Application of the solution blackens the affected tooth at the treatment area. Also, some teeth have decay that extended far into the exterior of the tooth, making a traditional filling necessary. Scientists who worked for the original FDA approval of the product are now seeking FDA approval to use the solution as a treatment for dental caries, and clinical trials are underway to further study the solution’s effectiveness.